The full day tour begins at 8.30 am daily throughout the year. We are comparing Best of Barcelona Tour Prices from leading ticket suppliers and Try to find you Cheap tickets prices on the market. 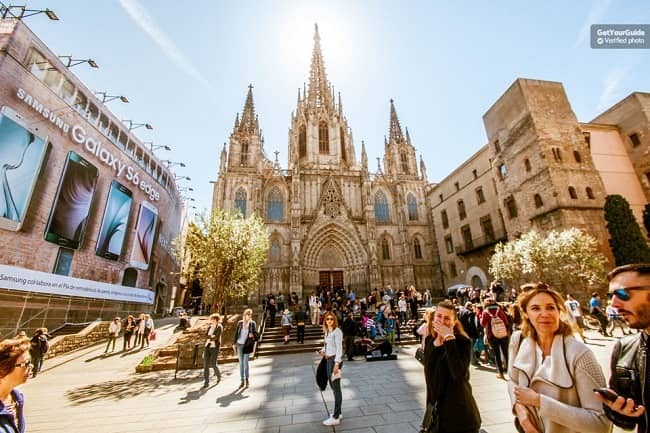 Join the Best of Barcelona full day sightseeing experience for a jam-packed day discovering the architectural gems, historic areas and modern parts of the city. Take an extensive walking tour of the city centre to see three of Antoni Gaudi's most revered constructions, the Art Nouveau inspired Casa Batllo, La Pedrera and the majestic Basilica de la Sagrada Familia. You'll begin by passing along Barcelona's modern designer highstreets, Passeig de Gracia, and later jump back to the medieval times when the Gothic Quarter was first built. A knowledgeable local guide will take you though the oldest streets in the city, into the Jewish Quarter, past the Church of Santa Maria del Mar and the Royal Palace, guiding you to the flower lined gardens or Park Guell. Along the way your guide will provide an engaging commentary and fill you in on the myths and truths of the city, learn about the Architectural Modernisme Movement and the significance of Gaudi's designs during this era. The Best of Barcelona tour also includes a visit to the Olympic Port, stopping at the Catalunya Museum of National Art and pausing for panoramic pictures at Montjuic. In the morning you will receive a guided tour of La Sagrada Familia (Barcelona's Cathedral) with priority skip the line entrance so you won't loose any time waiting in line. The final stop on the Best of Barcelona tour is at Gaudi La Pedrera, your guide will lead you through the rooms of elaborate architecture before bidding you farewell. The tour will end in La Pedrera and you will be welcome to stay until closing time. This is the perfect tour for first time visitors to Barcelona and anyone interested in art and history, in a compact 8-hour guided you will see the top city attraction and discover lesser known locations. Your Experience With Best of Barcelona Tour? Take a comprehensive day tour to the top sights that Barcelona has to offer, including Gaudi's masterpiece, la Basilica e la Sagrada Familia. Travel stress-free around the city in the company of a small group and professional tour guide. Walk the streets of the medieval Gothic Quarter and stroll through the charming city park, Park Guell. Hear the facts behind the construction of Barcelona's grand cathedral and listen to the stories of the city itself. Skip the lines to enter La Sagrada Familia and Gaudi's Pedrera. What Best of Barcelona Tour Includes? Skip the line Entrance and guided tour of La Sagrada Familia, including the onsite museum. A full day, small group, city tour with professional English speaking guide. Transport by mini-van between attractions in the city. Entrance fee and tour of Park Guell and La Pedrera. Book this tour if you only have a short time in Barcelona and want to cover all of the main attractions. Travelers Reviews about Best of Barcelona Tour? Travellers have said that this is an excellent tour and the best way to get to know the city. On TripAdvisor and Viator this tour has 4.5-star feedback. On Get Your Guide the Best of Barcelona tour has earned 4.7 out of 5-stars. Some comments point out that this is quite a fast paced tour as so many things are fitted into one day. All tickets are fully refundable up to 7 days in advance, tickets may still be refundable up to 24 hours in advance but this is dependent of the tour providers policy, cancellation policies will be available when making your booking. A dress code applies to visit La Sagrada Familia and any other religious sites, shoulders and knees must be covered, visitors may not be permitted to enter if they are not wearing the appropriate clothing. This applies to both men and women. Comfortable walking shoes are recommended as a reasonable amount of walking is involved in this tour. La Pedrera will be closed for a week in January due to maintenance works, an alternative will replace this visit. This a small group tour, a maximum of 9 people may join. Minimum age allowed on this tour is 3 years old. The Best of Barcelona tour will meet in the city centre. Exact location will be given in the booking confirmation.